We review one of Logitech's gaming mice, the G402 Hyperion Fury. 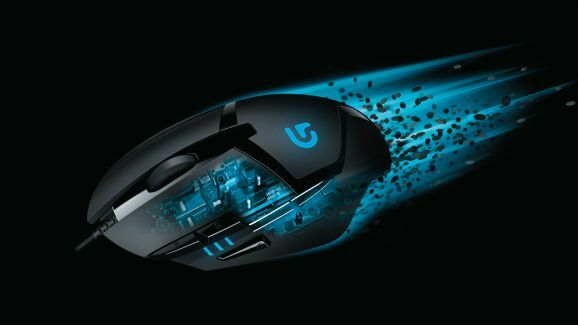 Logitech announced its G402 Hyperion Fury earlier this summer, calling it “the world’s fastest gaming mouse.” This mouse is more than just your run of the mill peripheral as Logitech has equipped it with multiple sensors in order to help accurately track extremely fast swipes of speeds of up to 1000 inches per second. It does this through a combination of sensors, which include a standard optical sensor, accelerometer and gyroscope. The G402 Hyperion Fury is being marketed as being a go-to mouse for those who take their FPS games seriously. So should FPS really consider the G402 Hyperion Fury as their go-to mouse? That’s exactly what we’re here to find out. As soon as I put my hand on the G402, my hand forms around it surprisingly well. My middle portion of my hand is able to rest comfortably on the back of the mouse, while my index and middle finger fall onto the primary and secondary buttons of the mouse without having to strain them. The area where my thumb sits has a slight rubberized feel to it as well as the side where my ring finger grips the mouse. The right side of the mouse not only has a rubberized feel to it, but there are also slightly raised lines to improve my hold of the device. In addition to the standard primary and secondary mouse buttons, there are three buttons that my thumb can instantly access with very little effort. Above my thumb are two buttons that can be used to perform a “back” or “forward” command while browsing the web, while the one in front is used to slow down the tracking of the mouse’s input. The purpose for this is for those moments when you need your crosshairs to suddenly move slower in first-person shooters, such as when you switch to a sniper rifle or another weapon that requires slower tracking. Of course, all of these buttons can be customized to do whatever you’d prefer them to. The next set of buttons can be accessed from my index finger. First, is the standard track wheel which offers a nice clicky feel to it when a track is initiated, and, as expected, it’s clickable. To the left of my index finger are two additional buttons that tune the speed of the mouse’s DPI sensitivity. By default, you can jump from 400, 800, 1600, 3200 and 4000 DPI on the fly, but those values, even the levels, can be customized to give you the amount of sensitivity you’re looking for. Even with all of its advanced sensors, the mouse feels lightweight and is easy to move across a number of textures which include a standard mouse pad, my glass desk and on my dining room table. As you'd expect, I felt more comfortable moving the mouse on top of a mouse pad since it was able to glide easily while also not moving too far as it would on a texture that didn’t have any kind of fabric to hold it better. The back of the mouse has Logitech’s “G” logo on it, which is usually featured on the company’s gaming peripherals. The 'G' has a 'breathing effect' that can be activated if you like, and you’re able to set how frequently it pulsates, or remove it entirely. You can also choose to completely turn off the light of its logo, but where’s the fun in that? A lighting sleeping time can also be set for those who don’t want your mouse to drain any more energy than it needs to, especially if you won’t be around for several hours. For this portion of my test, I played several games that included Hearthstone, Minimal, Gone Home, Team Fortress 2 and Wasteland 2. 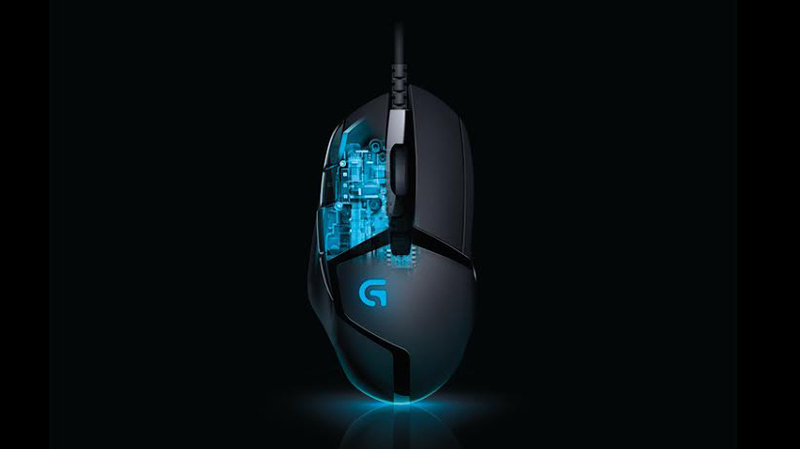 I wanted to get a broad range of games to play with the mouse rather than just focusing on playing first-person shooters, even though the G402 is geared towards those kind of games. Since first-person shooters is where Logitech focused for the G402, I played those first on top of a standard mouse pad. The mouse performed exceptionally well while playing FPS games as I was able to quickly move my crosshairs exactly where I need it to go, and being able to tweak the DPI sensitivity on the fly without having to exit out of my game really helped when I needed it to. The track wheel was also easy to get to when I needed to access it in order to change my weapons or perform an additional command within the game. One thing that really helped with my FPS sessions was the button located in front of where my thumb sits. When I was equipped with a sniper rifle, or if I wanted to attempt to get a headshot without having to zoom in, holding down on this button to suddenly drop my DPI to a crawl is really helpful. When playing games that don’t require all of the bells and whistles Logitech gave FPS players in the G402, such as Hearthstone and Wasteland 2, the mouse still felt very comfortable to use.I felt kind of guilty using a mouse like this for non-FPS games, although the additional buttons came in handy when playing RTS games, like Age of Empires, as it allows me to have more options for commands without having to resort to using the keyboard or a hotkey. I guess the same could be said for MOBA, MMO and any other game where you’d like to have quicker access to certain commands. I know installing software from a peripheral's creator can lead many PC gamers to cringe just at the mere mention of it, but Logitech's Gaming Software didn’t bog down my machine with any additional software that I didn’t ask for in the first place. For the G402, the software allowed me to control all of the hardware aspects I mentioned previously was configurable, including the lights on the mouse. 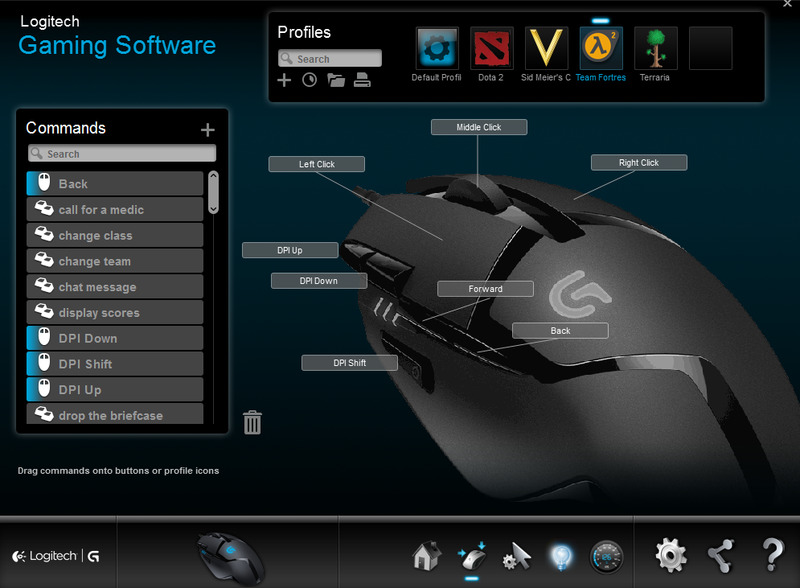 All of the buttons can be configured either by your own preference, or through the software’s ability to detect what games you currently have installed on your PC and recommending what mouse buttons and keys do what when you play. The Gaming Software even has a section to show just how improved the speed of the mouse is with all of the sensors turned on, which Logitech calls its 'Fusion Engine,' versus the mouse with just its optical sensor. The G402 Hyperion Fury Gaming Mouse is a very good mouse that should serve as an introduction into the wonderful world of professional gaming mice. The G402 has some nice bells and whistles, has some slick aesthetics and is comfortable to use, but those who take their FPS gaming serious might want to splurge on something that can really take their game to the next level, such as Logitech’s G502 or the Mad Catz R.A.T. 9. This review is based on a unit provided by the manufacturer. The G402 is available in retail stores for $59.99. Daniel Perez posted a new article, G402 Hyperion Fury Gaming Mouse Review. So what do the accelerometer and gyroscope do? The lack of a free-scrolling wheel in mice means I won't buy them now. Yeah, I got really used to that feature. Can't stand using a mouse that doesn't have this now. You just don't realize how much you'd actually use this until it's in your hand. Yeah, I just bought this mouse yesterday to replace my G9x and I thought it had a free-scroll wheel, but it looks like that's only on the G502. I'm really missing it and it hurts what would otherwise be a great mouse. I'm sporting a G500 (not G500s), and love this feature. The G502 will be for my next computer when I can get it on sale. I've managed to snag all my mice thus far (mx518, G5, and G500) on sales/rebates for $35 or less. I'm sure as hell not spending $60-75 on a mouse. I've never used a free scrolling mouse. What do you use it for? Documents and long web pages. It's more a productivity thing than it is for gaming.